Our project measures the user's skin conductance for monitoring his or her mental state. Medical experiments have shown that the magnitude of the electrical conductance in a person's skin is directly correlated to their emotional state. The short term changes in electrical conductances also correlate with a person's mental response. We implemented an EDA meter designed to measure skin conductance. Our design includes our own sensor, pushbuttons for user input, and an LCD menu that accesses several software features including an event recorder, waveform capture, an stimulus comparison test, and a simple biofeedback game. The software can also transmit data to the PC, where a java program collects and displays the data over a set interval of time. This device is the result of a class project and is not to be construed as a medical device. Please make certain that the device is connected to a battery-powered pc when using serial port. Skin conductance is known to be correlated with an individual's emotional state. It is often used in psychology for quantifying a person's reaction to different stimulus. It is also often implemented in a traditional lie detectors. The current theory is that a person under arousal generates sweat at the skin that changes the skin's electrical properties. However, this explanation is still debatable, as some scientists claim that the conductance changes too fast to attribute the cause to sweat. Because a change in mental state can be observed by the change in skin conductance, the arousal level of a person can be quantified. While one of us is interested in visualizing the meditative experiences, the other wanted to recreate the lie detector test seen in one too many movies. We were also intrigued by this project because of the controversial results found in different studies such as the 'prestimulus' response, and the characterization of psychotics using skin conductance patterns. There was also the allure of the use of skin conductance in many parapsychological experiments. Please read hardware details first. We needed to calculate three resistor values and the gain of the differential amplifier depending on the range of skin conductance values we want to measure. Human skin conductance values are supposedly only linear when voltages applied are below 0.5V. So we used a voltage divider to bring the bridge Vdd voltage to 0.5V. This ensures that the highest voltage across the user would never exceed 0.5V. At first we met with the problem that the relationship between skin conductance S and output voltage Vo is not linear. The following graph displays resistor values and gain chosen for a skin conductance range of (2uS - 50uS). One can see that the resolution for skin conductance is ridiculously good below 5uS but suffers as the skin conductance climbs. Eventually, we came to realize that we can linearize the curve by choosing C1 as large as possible. We ended up revising the skin conductance range to (2uS - 25uS) and a C1 value of 500uS (2kOhms). C2, C3, G are all calculated based on the skin conductance range constraint. This gave us a consistent skin conductance resolution over all voltages. The matlab script for generating these solutions can be found in the appendix. A passive low pass filter was created to filter the output with cutoff frequency of 0.5 Hz. 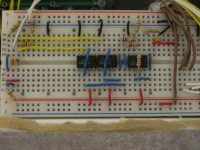 To convert 10-bit ADC value to a high resolution voltage. ADCW contains the 10-bit value at the most significant end. Therefore, voltage must be measured in centi-volts. To convert Vo to skin conductance value in uS. Skin conductance value will be stored as hundreds of microsiemens. The reason that the skin conductance values are stored to values beyond their absolute accuracy (.046uS) is because in software we will run a gaussian smoothing filter to interpolate the data. We used a gaussian smoothing filter to smooth the skin conductance values. To increase speed of execution, we implemented the filter in fixed point notation. Our GSR design is based around the Mega32 microcontroller. Skin conductance readings are taken from a test subject and are amplified and filtered using our hardware design seen in the hardware section of the lab. 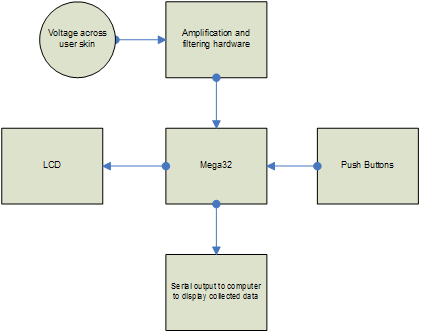 We send the signal to the Mega32 through PortA0, the input to the ADC. We programmed the Mega32 for 10-bit ADC to increase the resolution of the data. The pushbuttons allows the user to select and interact with different softwares: detect events, waveform capture, stimulus comparison, and a biofeedback game. The data collected under the different modes are processed and output to the LCD. We also have a serial connection that can be connected to a computer. A java program reads from the serial port using a freeware communications package. It then collects the skin conductance values and outputs to a graph generated by a freeware charting package. Because our hardware is not as technically rigorous as some other projects, we spent much time to enhance the software elements. By adding many interesting features to the software, we feel that we compensated for the lack of difficulty in our hardware with the blood and sweat we put into hours of debugging. Since this device is connected to a human, we had to comply to the class safety standard that there should never be a connection from the human to the 120 V power grid. Furthermore, we made sure that the electrode placement would never be on opposite sides of the body given that even small currents can cause fibrillation in the heart. There should be no patent, copyright or trademark infringement issues in our project as all work is our own and we did not modify preexisting design. Sources of inspiration and help are listed in the references section. A wheatstone bridge is implemented to measure skin conductance. The voltage across the bridge can be used to extrapolate the skin conductance. We feed the voltage at both ends of the bridge to a voltage follower and then into a differential amplifier. The output of the differential amplifier is fed into a low pass filter of cutoff frequency 0.5Hz, and then into PortA0, where ADC takes place. We built the hardware during one lab period. It would undercome many revisions down the road, but at the time, we were uncertain of whether the hardware was working at all. It was then that we realized that simply acquiring the skin conductance value is not enough; we needed to graph the skin conductance over a range of time. Without visualization, we will never be certain of the data. A week later, we had coded out a java program to collect and display the data. But even then we were still not sure what we were looking at. Two amazing things happened to us. First we decided to scratch the aluminum electrodes we had been working on. Second, we found a video on the internet that is guaranteed to scare whoever watches it. The graph worked wonderfully. The increase in skin conductance caused by the video also gave us new confidence in the data we were collecting. Below are two examples to establish the genuine nature of the data we were collecting. Left shows a graph of 5 minutes of activity. Another 5 minutes devoted to meditation shows a radically cleaner graph, free from waveforms. 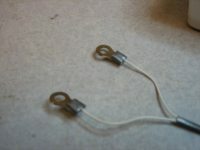 We fabricated our own electrodes using o-rings and wire from lab. Although not ideal, we found that our design gave superb readings for our purposes. We have 2 electrodes that are placed at the distal phalanges of the index and middle finger. The electrodes are then connected to the ends of the wheatstone bridge. The LCD is connected to the Mega32 through the PortC pins as was done in Lab 1. The pin connections are shown in Lab 1 which can be reached through the reference section. The LCD is the interface between the user and the various skin conductance programs within the MCU. The pushbuttons are connected to PortA of the Mega32. They allow the user to control the different settings of our design. If pressed, the pushbutton is shorted to a ground connection and an output low signal is seen by the Mega32. We used the Mega32 for analog-digital conversion, reading inputs from pushbuttons, and outputting to the LCD. We powered our design using a 9V battery that was regulated down to 5V for the purposed of the Mega32. We did not use power from a wall socket, as any path connecting a human being to the power grid was an unacceptable safety hazard for this lab. We had considered cramming as many skin conductance values into SRAM as we possible can, and then display it graphically on the portable black and white TV. However, when a Java serials communication and charting package got into our hands, we realized we could take the alternative approach of simply sending all data to the pc for processing and display. This gave us the opportunity to focus on more rewarding software implementations. The difficulty in doing the software is the inability to visualize the skin conductance values in real time. If building a robot, and the robot stops moving, it is obvious a bug exists in the program. When measuring skin conductance, we were never really certain if the data we collected was correct unless it was radically off mark. Debugging became a nightmare, as the skin conductance charts became our only window for looking into our mistakes. We built our event detection algorithm into Java first before implementing it in C. There are four steps in event detection. All conductance values have already been collected and UART transmission has halted. Gaussian smoothing is achieved by convoluting the conductance values with an array of seven values. Forward difference is simply taking the difference between consecutive points. The smoothing is necessary because while the data has been hardware low pass filtered, there are still many artifacts. It also acts to break up the discretized data due to the insufficient skin conductance resolution. Smoothing the forward difference acts to prevent glitches where two consecutive discretized skin conductance values register a zero slope. Finally, a detection algorithm finds the number of times the slope breaks a set threshold level. We ended up classifying each wave by the maximum slope it achieves during its ascent. We hypothesized that the faster waves indicate a more intense emotional response. From this assumption, we classified each event into five categories (excited, aroused, alerted, normal, relaxed). After the java event detection algorithm was complete, we proceeded to translate the algorithm onto the MCU. We realized we could not collect data in the MCU without overflowing the SRAM. Data collection is conducted at a rate of 8Hz. Even 5 minutes would translate to 2400 8-bit ints, more than what the Mega32 chip can handle. So we decided we would process and collect all events within 15 seconds of data.The plan worked beautifully, and we capped the time at 30 minutes only because we were afraid the number of events might exceed what can be displayed by the LCD! In actuality, we can run the event detection algorithm indefinitely. However, we then compared the events collected by java with the events collected by the MCU; they were different. This was a big mystery, as we implemented the exact same code into the MCU as we did Java. After some nights of headache, we came to realize the problem. We took data every fifteen seconds, smoothed it, forward differenced it, then smoothed the forward difference, where it is then fed into the event detection algorithm. It turns out that for every gaussian smoothing, we were ignoring the first and last three points! Almost a second of data is not being smoothed every 15 seconds, and it turned out to make a huge difference. So for every 15 seconds round of collection, we had to save the last six data points and carry it to the next round so that all points are convoluted over the entire duration of event detection. This solved the problem, and the java and MCU yielded the same results. When measuring skin conductance, there is the skin conductance level (SCL) and skin conductance response (SCR). SCL is the slow varying skin conductance value, changing over the course of minutes. SCR is the fast varying skin conductance value, changing over the course of seconds. The SCR that rides on top of the SCL reflects a person's mental response to various stimulus. SCR has several statistics that are useful for psychologists. First is latency, which is the amount of time between the stimulus and the rise of the wave. Next is the rise time, how long it takes for the skin conductance to shoot up to it's peak. Amplitude is the height of the SCR. Half recovery time is the amount of time it takes for the wave to fall back to half it's amplitude. We decide it would be useful if we were able to capture these four statistics whenever a wave is detectable. However, this would require that the program read and analyze the data in real-time! So we decided we would store 7 data points of skin conductance values, enough to gaussian smooth just one point. We would then save two of the smoothed conductance points, enough so we can forward difference them. We would then store 7 data points of the forward difference, enough so we can gaussian smooth that. Finally, we store 2 data points of the smoothed slope points to drive the state machine. The operations of the state machine is listed below. If slope is increasing, keep recording maximum slope value. If slope starts decreasing, check to make certain slope does not start increasing again. Wait for wave to fall to half of amplitude. At first we encountered huge problems. Whenever we tried to verify the statistics we obtained, it turned out to be wildly different than what we observed on the Java graphs. Waves were not being captured and statistics were fishy. After much confusion, we realized the problem. It turns out that the smoothed slope value we fed into the state machine actual corresponds to data taken 8 points before! In other words, the state machine is being driven by data 1 second in the past! Therefore, what we see on the state machine is not actually real-time, but 1 second into the past. We quickly adjusted our software for this error, and the waveform capture now works like a charm. To capture latency, we allow the user to press a button to indicate a stimulus during the Waiting for wave state. It would then record the time between the press of the button and the start of the rising of the wave. A second is subtracted off to keep consistent with the fact that the state machine is a second behind reality. If latency is ever less than zero or greater than eight seconds, the program will indicate to the user of the possible incorrect nature of the wave. The purpose of measuring latency is to see the reaction of a person to a stimulus. If the person had not reacted to the stimulus in the appropriate amount of time (1-4 sec), then it can be assumed that the wave probably does not reflect the stimulus. At first we attempted to write a lie detection program. However, after extensive testing, we realized that we could not generate an algorithm to determine decption without resorting to a lot of standardized procedures, much of which cannot be handled by software. So we decided that we would create a handy software where the interrogator, or any psychologist, can record statistics of different stimulus. The program will then compare the stimulus with each other so that the psychologist can measure the differences in statistical results among events. As the wave capture is already working, the stimulus comparison was quite easy to implement. When the program is activated, we turn on the real-time waveform analyzer. We then added some modifications so that the user can store up to 20 different events. 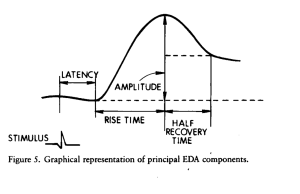 The main statistical variables in the spotlight are latency, amplitude, and half recovery time. Latency is thought to reflect the amount of attention placed on the stimulus by the individual. Amplitude reflects the strength of the reaction of the user to the stimulus. Half recovery time reflects how fast the individual recovers from the stimulus. All three holds potential information for deception detection. The program stores the statistics into an array, where it then finds the maximum value of each variable. A percentage is then given for the statistics of each stimulus in respect to that maximum. Therefore, the relative strengths of the stimulus is accessible and intuitive. We ran into little trouble programming the biofeedback game. The game simply toggles between two different states depending on the user's skin conductance. If the user is calm, indicated by an extended period of lack of SCRs, the game slows down, and the race track has less obstacles. However, if the user is agitated, indicated by SCRs with sufficient slope at rise time, the game speeds up, and the race track has more obstacles. If the person relaxes more, the likelihood of getting a higher score increases. This feedback ensures that the person is working toward a more tranquil state of mind. While testing our design, we implemented several different electrode designs to find the one that would give us the cleanest signal. We found that several things did not work. First, a simple wire pressed against the skin was flimsy and provided too small a surface contact. Then, per the suggestion of a website, we built electrodes out of aluminum and velcro wrapped around the fingers. This design caused the skin to perspire independent of emotional stimulation. We finally settled on o-ring connectors which provided good surface contact and some amazing results. A semi-goal that we entertained ourselves with, but which we did not ultimately implement, was the lie detector. Although we were able to accurately show emotional response to stimulus from questions and visuals, we had trouble coming up with an algorithm to detect lies from the data collected. One problem may be that we simulated the lie detection in a very informal atmosphere. When we lied about trivial facts, we did not fear the other knowing the deception, and the response detected was low and often insignificant. Yet when we decided to change the topic to more sensitive questions, the meter detected a response everytime regardless of truth and lies. We then noticed that we get the best results when we ask questions that the user does not expect. Yet, to simulate this proved to be both embarrassing and difficult, as the user does not have time to prepare for a lie. And we both preferred to know what we were going to be asked before the question arose. Thus, we revised our software so it compares the emotional responses among many stimulus. From the continual experimentation we learned a lot about each other that we did and did not wanted to know. The meter has an accuracy of 0.05uS. Speed of execution is sufficient and timing is precise. We enforced safety in our design in two ways. We used a 9V battery instead of using 120V from the wall in compliance with the class room safety standard. In doing so, we eliminated any path from the user to the power grid. 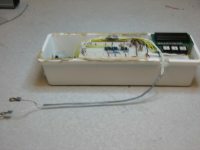 Furthermore, we encased our project in a container so that no extraneous wires or components were accessible to the user. Since we did not use any type of wireless transmission in our design, we foresee no interference with other people's design. This completed project is meant only as an academic experiment to test the correlation between skin resistance and emotional response and as a recreational device. Therefore, it will not have widespread use outside of lab other than perhaps a recreational device. Concerning ease of use, we feel that placing our final product in a case simplifies using the design. The final results of this project met the goals we set for ourselves. Although we came across several limitations in our design due to monetary and time constraints, we feel that we were able to assemble a solid project in the given time. One limiting factor was the inability to buy or sample electrodes because of the exorbitant price. While professionally manufactured electrodes would have greatly increased the resolution of our data sampling, we feel that the results we obtained from the electrodes we fabricated were more than satisfactory. Data shown in our graphs clearly show a subject's response to different questions asked as well as to visual stimulus. Due to the wide disparity in our results, we could not get our software to recognize a lie. However, as humans, we were better able to analyze results and occasionally predicted where lies occurred. In hindsight, there are a few design aspects that we would change. Adding hardware to detect user pulse would increase the efficacy of the lie detection. Furthermore, we would improve upon our electrodes design to acquire better data. There exists no path between human and 120V power grid. All hardware designs are in the public domain. Code in software is not reused. We have done our utmost to keep the user of our project safe. We isolated the user from the 120V power grid by using a 9V battery. We avoided them, and we will disclose them if they do arise. Our interest in this project was academic. The lie detection portion of our project is not an accurate or acceptable way for determining deception. We were not bribed, nor would we take bribes. This project uses known technologies. Our project does not have potential consequences. This project gave both members a means of improving our technical competence.We believe that this project is not beyond our technological limitations. We credit sources of inspiration and technical help in the references section. Our respective contributions are documented.We shall seek and accept criticism in the form of our demo. No person was treated unfairly while completing this project. No person, property, reputation, or employment was injured by our actions. We assisted colleagues in the lab. By reporting the results of our project, we indirectly help our colleagues in their professional development.